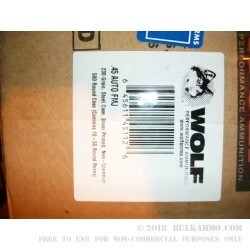 This .45 ACP Wolf ammo puts big holes in paper without putting a big hole in your budget. 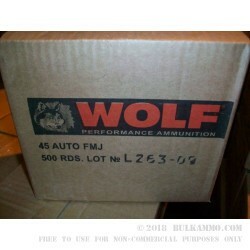 Each cartridge in this box of 50 fires a heavy 230 grain bimetal jacket bullet at a muzzle velocity of 850 feet per second. 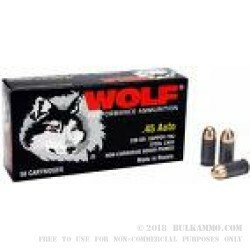 These specs result in typical ballistics for the .45 Auto and heavy but manageable recoil. 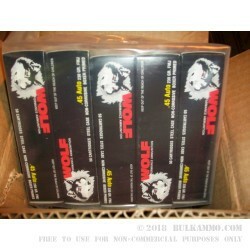 Wolf ammo is made in Russia using non-corrosive Berdan primers and steel cases. The steel cases are non-reloadable and come with a polymer coating for reliable cycling. Because of its magnetic components, this ammo may not be suitable for all indoor ranges. Check before ordering if unsure!